Meet Jennifer! She is one of our lovely teachers at Yoga District. 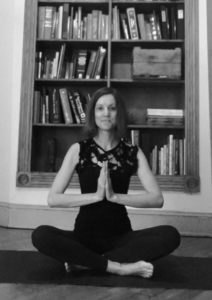 For Jennifer, yoga has helped her to not only navigate many of life’s transformations but also create her own positive self-transformations too. Saturday 3:30 PM, Ashtanga Flow (All Levels) @ 14th St.
Wellness is important to me. I ran cross country in high school then continued running afterwards to stay healthy and de-stress. I grew up in Illinois, so I ran through prairie preserves to connect with nature and loved the meditative aspect of it. Running a marathon when I was twenty-two allowed me to check off a life dream. Then I searched for a new physical and mental outlet. Since high school, I’ve been complementing running with practicing at home with yoga videos. Yoga has entered my life during transformations. The first type of studio yoga I practiced regularly was hot yoga because that studio was close to where I lived. The runner in me liked to sweat. I tried different styles and gravitated to Ashtanga Yoga since it builds heat naturally. That’s what got me hooked! I went through personal growth in my early twenties and was fortunate to find work at a yoga studio. Deepening my physical yoga practice guided me to get out of my head and become grounded in my body. This enabled me to start to live from a more authentic place. Then I attended my yoga teacher training, where I learned meditation. This allowed me to dig deep to take my next steps — all from a place of love and gratitude for the journey. I share yoga to help others experience the groundedness, self-assurance and non-judgemental awareness that I’ve gained through my practice. I love all the classes I teach! I lived in South Asia for two years and have close personal ties to that region — I did my teacher training there! I love the opening and closing Sanskrit chants along with the traditional Ashtanga sequence. It keeps me connected to that time in my life and to the heart of what yoga means to me. I love teaching restorative yoga and meditation because they remind me of the importance of depth and intention. I personally enjoy a balance of intensity, relaxation and mindfulness in my yoga practice. I also like to challenge myself to try new things. So I love teaching flow classes to mix things up and often experiment with new sequences to match the vibes I get from each of the classes I teach. I used to be intimidated by yoga studios; now I know there is no cookie-cutter way to be a yogi. I love Yoga District because it cultivates such an inclusive environment and allows us teachers to be our authentic selves. Before I became a yoga teacher, I worked at a studio. This allowed me to deepen my practice without having to pay for expensive classes. If price is a barrier then I tell people to check out work/study opportunities. When I experienced some of my most major transformations through yoga, I was not strong enough, flexible enough, or balanced enough to do a lot of poses. I share that with folks who are new to the practice because asanas, though empowering, are not the point of yoga. 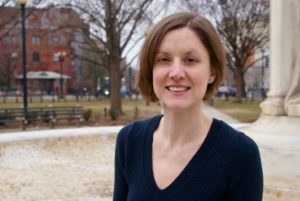 Living and Learning in Washington, D.C. I am grateful for the amazing friends that I have in this city and I love hanging out with them. I did a lot of deep personal work to cultivate a safe, healthy, uplifting group of people around me — my sangha. 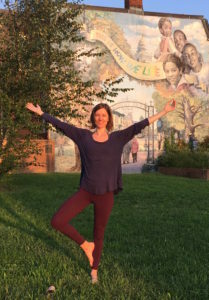 I was glad to see that Yoga District recently hosted the Building Community and Connection workshop so that more people can experience those benefits. I also love the sense of community that I feel throughout DC. Krerk and the team at Aroi, the Thai place next to our Bloomie studio, let me sit inside their restaurant before I teach my class when it’s raining. Celeste at Trader Joe’s on 14th St. teaches me about wine when I stop in before my Saturday Ashtanga class. I am blessed to really enjoy these day-to-day moments. 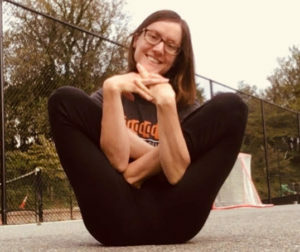 Garbha Pindasana (Embryo Pose) is my favorite pose! I have rolled around, collided with people, fallen apart, then pulled myself up, eventually laughed and smiled while building strength throughout it.